The Fast Five – Meet those five businesses with the fastest growing revenue on the Top 100 Private Companies list. 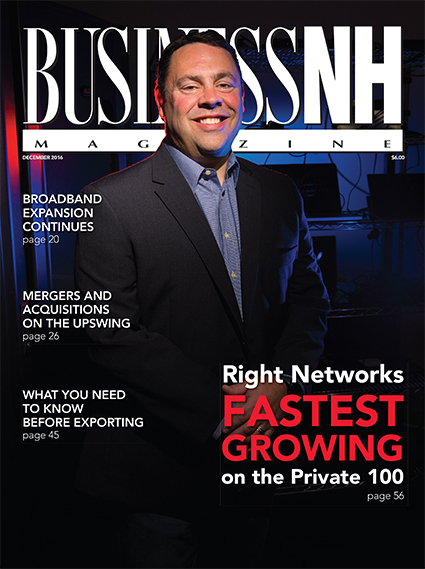 Broadband Expansion – Broadband access is moving to Phase 2 in the Granite State. Mergers and Acquisitions Update – Before putting your business on the market, read this piece. What You Need to Know Before Exporting – Get your business ready to tap into the global marketplace with this primer. Top 100 Private Companies – Find out who made our annual list. 10 To Watch – We profile 10 companies that have not yet generated enough revenue to make the Private 100 list but are rising stars. Grayed Expectations – Everyone dreams about retirement, so we put together a guide to help you realize those dreams. The Office – Be the CEO of first impressions. Tech Report – KudosWall seeks to be a LinkedIn for kids.